What has Brad Ellsworth been doing for the last four years? 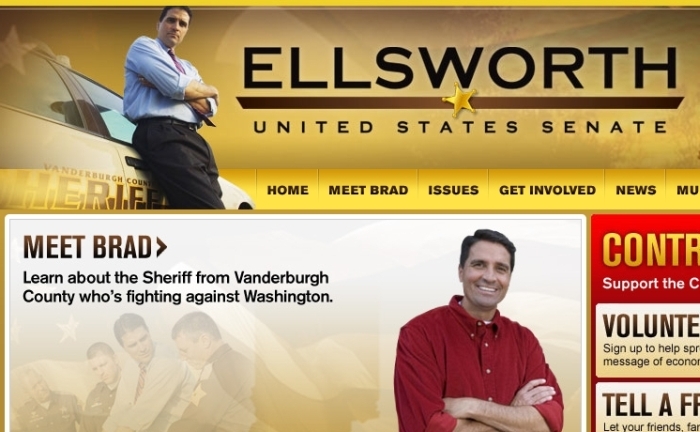 Brad Ellsworth has been a member of Congress since January 2007. He was first elected in the Democratic sweep of 2006, and was re-elected in a landslide in 2008. When Evan Bayh decided he was not going to run for re-election to the U.S. Senate earlier this year, Bayh hand-picked Ellsworth to replace him. So since Ellsworth is in his fourth year representing southwest Indiana in Washington, you would think that would be the most relevant portion of his résumé for his campaign for the Senate. You would think that he would focus on the last four years in the House in order to convince voters to promote him to the Senate. You would be wrong. OK, so Ellsworth used to be a Sheriff. Whoop de diddly do. The voters of the 8th District knew that in 2006. But it is not 2006 any more. If Ellsworth expects to get a promotion in November, the focus should be on what he's been doing since going to Washington rather than recycling his old campaign. Think about this from another perspective. Imagine you are hired by Company X to do a certain job. Four years later, you're seeking a promotion to a higher-level position. In the interview, you bring the same résumé that you brought to the interview you had four years ago and you spend your interview talking about what you were doing then. The natural question your potential supervisor will ask is this: "What have you been doing the last four years?" Why would Ellsworth rest on what he had done four years ago instead of his most recent accomplishments? The reason is obvious. Ellsworth does not want voters to focus on what he has been doing since January 2007. After all, Ellsworth voted for the disastrous health care "reform" law passed by Congress and signed by President Obama. National Right to Life said before the vote that "a vote for the Senate-passed health bill (H.R. 3590) is a vote for the most expansively pro-abortion legislation ever to come before the House of Representatives." After the vote, Scott Fluhr argued that "there is no such thing as a pro-life Democrat." Keep in mind that Ellsworth campaigned as a pro-life candidate, and was recruited by Democrats because of his allegedly "pro-life" and "pro-gun" views. Democrats knew they could not defeat incumbent John Hostettler by running a socially liberal candidate. Democrats knew a change in strategery was necessary after they lost the 2004 Presidential election in large part due to the "values voters." Democrats responded by recruiting candidates like Ellsworth. Ellsworth, like Baron Hill, has been a lapdog for President Obama. He is allowed a conscience vote here and there, but he is expected to be there for Nancy Pelosi when it matters most. In the Senate, where individual members have much more influence, it is more important than ever to elect anyone other than Brad Ellsworth.